It was a sad day last week, when I received the news that a dear friend of mine's dog passed away. After hours and days of trying to comfort her - she passed quietly. The loss of a pet, no matter what it is, still is the same. Be it the goldfish that you won at the carnival or the dog that you had as small child. All is the same. I didn't have any 'going over the rainbow' quotes that the Best Friends Foundation uses, but I did have this one. 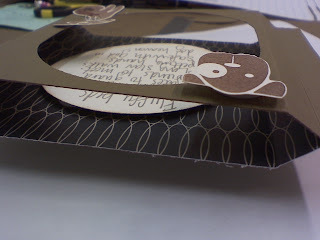 I put this together like a shadow box, with the saying in the inside, and then wrote on the back. 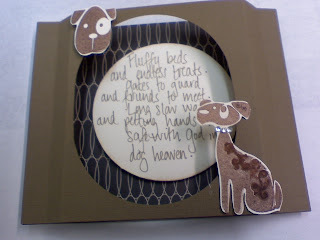 The quote reads: "Fluffy beds and endless treats. Gates to Guard and Friends to meet. Long slow walks and petting hands. 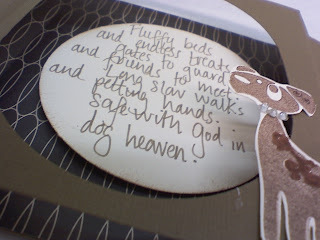 Safe with God in Dog heaven." Erin kiddo- Our thoughts are with you. May the other two furry friends let Patches shine thru!